Thanks to Denis who has supplied the name - Dictyophora multicolor. He has also posted some interesting links. Well worth a look. 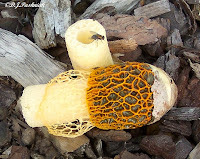 Your Stinkhorn is one of the few which really earns the name on all counts. Mine look like severed arteries, not "horn" shaped. The ANBG (Botanic Gardens - Canberra) site I linked to under Gasteromycetes in the text of my article has a good photo and description of their structure. I have never seen such a beauty, unfortunately. PS They are not plants - I suppose you know that. They do not have cellulose, nor chlorophyll. More akin to insects, perhaps. And some of the "Stinkhorns" are mobile. The "lattice fungi" roll around on the ground when they break free of the "egg-sac". Scary, when you first encounter them. Yours has a very fine "veil" or "skirt" - shame it was broken - but that often happens, as they are so delicate. Forgot to confirm your comment that they very likely came in with your bark chips. Exactly the same with Les and Toni's Starfish fungi. Thank you Denis, that is all very interesting. I took that photo nearly 4 years ago and only thought to post it when I read your blog this morning. Thanks also for the links - they're interesting too. Now I can go back and label the photo correctly. Hi Mosure, I know nothing about fungi but thought I might learn a bit more if I posted this photo - and I have!! Blogging is great! Fungus season up here now. Plenty of bracket fungi and constellations of little mushrooms, but I haven't seen any of those wonderful stinkhorns. Did it pong? Hi Sebastian - interesting to know how wide-spread this species must be. Hi Snail, I never thought to put my nose down and smell it! I think it must have though as that fly was certainly attracted. I found another of my little red Starfish Stinkhorns yesterday, and remembered to smell it (It was already broken). Sure enough, it smelled like a Baby's nappy. The "gleba" (the goo) is the stuff which smells. I guesse it did smell very bad or?